Filling In New Orleans' Future, One Blank At A Time New Orleans residents are using Neighborland.com to post ideas for improving their neighborhoods. Initially a local public street art project, Neighborland tries to democratize city development by creating instant civic feedback. But the digital divide has left the city's computer illiterate out of the conversation. Candy Chang, co-founder of the website Neighborland, writes on an art installation in New Orleans in April. 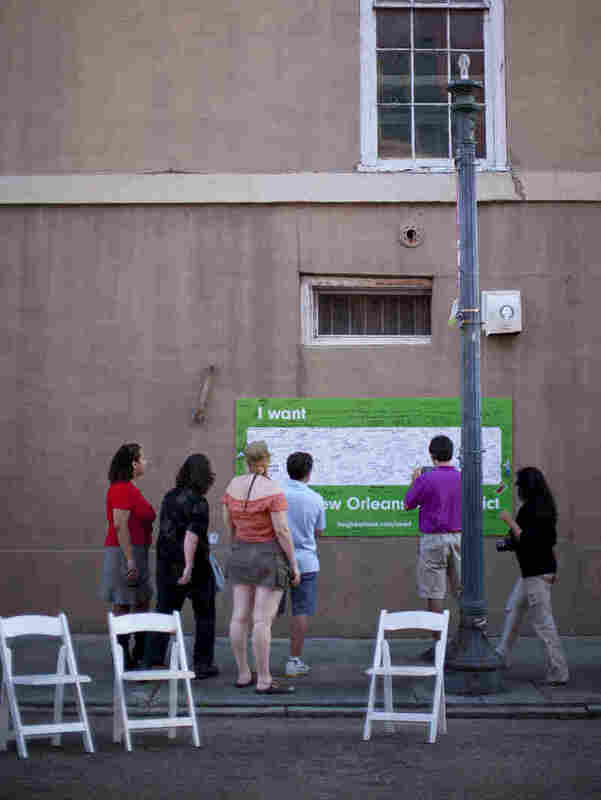 As part of a public street art project that later became Neighborland, Chang put nametag-like stickers on empty New Orleans storefronts for residents to write ideas for improving the city. New Orleans became a blank slate after Hurricane Katrina struck in 2005. And ever since, entrepreneurs have rushed in to experiment with new ideas for building and running a city. Among them is a startup called Neighborland.com, a social media tool for sharing ideas to make your neighborhood better. After signing in to Neighborland, you can find your neighborhood and post your idea. The posts all start with "I want," and you fill in the rest. Neighborland is part of a new genre of websites and apps designed to democratize what shows up in our communities. The project is currently active in several U.S. cities, including Chicago, Las Vegas and New York. But it all began a year ago in New Orleans. One of the most popular ideas for New Orleans on Neighborland is getting a streetcar line through downtown, an idea first proposed by Jasmine Fournier, a young health care worker who has a new house on St. Claude Avenue in the heart of the city. New Orleans has federal funds to add a new streetcar line on the avenue, but Fournier wants to see it extended farther. She thinks it will help her block feel more connected and less of a traffic corridor for drivers to speed through. "[St. Claude Avenue would become] a place where people are stopping," Fournier says. "And that's how you have a neighborhood: People stop." Fournier likes Neighborland because it allows her to be an advocate without attending endless meetings or otherwise disrupting her busy life. And that's exactly how the site's co-founder Candy Chang envisioned it: a tool for those who don't have the loudest voice or the time to show up at City Hall. "I feel like [there are] more and more tools to reach out across the world. But it's still hard to reach out to your entire neighborhood," says Chang, an artist and urban designer. "What if it was easier for us to say what we want, where we want it?" Festival-goers at the Jammin' on Julia street fair in New Orleans interact with Neighborland's art installation on the side of an empty building in the city's arts district in April. Neighborland grew out of one of Chang's public street art projects. She made nametag-sized stickers that said "I wish this was ___." Then, Chang posted the stickers around empty storefronts in New Orleans for residents to fill in the blanks. "People wanted a bakery, a nursery, a taco stand, [and] a place to sit and talk," she says. "I really like how in this little small space [on the sticker] the responses ranged from the functional to the really poetic, too. People said I wish this was heaven [and] Brad Pitt's house." One of the most popular posts in Chang's neighborhood, the Bywater — both on stickers and online — is "I wish this was a grocery store." Chang says the lone pre-Katrina supermarket has not reopened, so a Mardi Gras party store has helped fill the void, along with Mr. Okra, the local produce vendor who sings out the fruits and vegetables he sells from the back of a truck. Mr. Okra, pastel-painted shotgun houses, and streetcars are just some of the hallmarks of New Orleans, a city still reinventing itself in the wake of Katrina. Neighborland is one of dozens of entrepreneurial endeavors that have sprung up in the recovery. At City Hall, Councilwoman Kristin Gisleson Palmer says Neighborland's timing is good. "You know, after the storm, you fight so hard for what is that sense of community, and that discussion of neighborhood and planning, and what's really important to you," Gisleson Palmer says. "I think Neighborland kind of reflects that. You literally are putting your stamp on it." But so far, only a few hundred residents are using Neighborland, and it's hard to gauge yet what impact, if any, they've had in the project's first year. The bottom-up, democratic nature of Neighborland is not an easy sell when it comes to developers, driven more by market forecasts than citizen whims. One exception is Wisznia Architecture and Development. The firm has turned a long-abandoned office building, the Saratoga, into apartments on a corner near City Hall, the public library and a very busy bus stop. A sign on the building's ground floor asks, "What businesses do you want here?" and gives a number to text in answers. 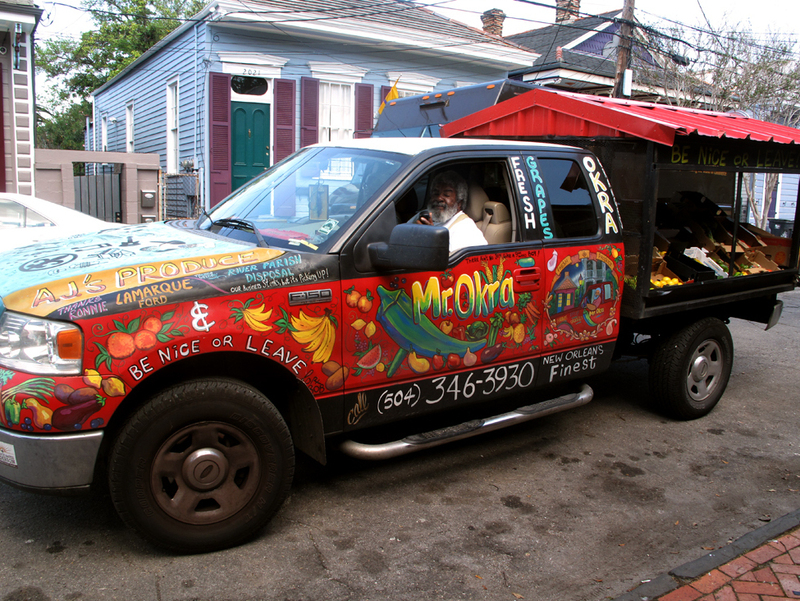 After Hurricane Katrina, local produce vendor Mr. Okra became the only source of fresh produce in New Orleans' Bywater neighborhood. Residents have posted calls for a local grocery story on Neighborland. Wisznia has received dozens of practical suggestions, according to the firm's architect Dan Weiner. He says input from the public has also helped the firm "form ideas on how these spaces can be put into commerce and make sense not just from the developers' standpoint but from the community's standpoint." Outside the Saratoga, at a bus stop at Tulane and Loyola avenues, ideas for neighborhood businesses ranged from an arcade to a restaurant. "They could put a liquor store in [the Saratoga], somewhere I could buy a cold beer [because] I'm here every day," says maintenance worker Michael Ray as he waits for the Algiers Loop bus to take him home. Ray likes the idea of having a say in local development, but like a significant part of New Orleans's population, he's not engaged in social media. "I'm computer illiterate," says Ray, who does not have a computer and does not text on his cellphone. "That's some of us in the world, you know." For now, Neighborland's users appear to be mostly white, educated, middle-class professionals — people like Fournier, who flocked to New Orleans to be a part of the city's new entrepreneurial vibe post-Katrina. From the front stoop of Fournier's double-shotgun house on St. Claude Avenue, you can see the signs of long-term neglect on the block: dilapidated storefronts and a few small businesses, like the payday loan shop a few doors down. The streetcar, she believes, can start to change that. "I'm here to watch the neighborhood come back," Fournier says, "and watch the check place turn into maybe a grocery store or something that would be useful for people around here." The NPR Cities Project is a series of stories exploring urban life in the 21st century. More than half the world's population now lives in urban areas, according to the United Nations. By 2050 that's expected to be more like 70 percent. Already in the United States more than 70 percent of us live in urban places, according to the U.S. Census Bureau. The NPR Cities Project aims to capture the vibrancy of urban life today, and asks the question: What do we want our cities to be in the "Urban Century?"